Actuators are primarily used to convert electric signals into mechanical movements or other physical variables such as temperature or pressure. Thus, they play a vital role in the functioning of control systems. For example, in applications in the aviation industry, it is important that actuators achieve very high dynamic forces and fit into small and tight spaces. Also, they have to withstand ambient conditions such as strong vibrations, heat, and cold. Furthermore, in the aviation industry, a wide range of applications are controlled by actuators such as controlling and limiting the velocity and engine speed by adjusting levers and flaps. Actuators are also equipped with valves and engines of aircraft. The market for aviation actuator system has witnessed significant growth over the last two decades. This is primarily attributable to rising demand for aircraft led by surge in the passenger traffic across the world. In recent years, there has been a significant increase in the demand for commercial passenger aircraft. This growth can be attributed to continued economic growth, increasing consumer spending, especially in developing economies such as India and China, and growing global passenger traffic. In order to serve rising passenger traffic, the production of several new aircraft such as Boeing 737 Max, Airbus A320neo and A350, and Bombardier C-series, which are predominantly used for air travel, has been increased. These factors are likely to drive the global aviation actuator system market during the forecast period. Developing economies such as China and India present significant growth opportunities to the aviation actuator system market. This can be attributed to the rapidly increasing demand for air travel in these countries. As stated by the prominent aircraft maker Boeing in September 2018, airlines based in China are expected to buy 7,690 new planes worth US$ 1.2 Trn over the next two decades in order to meet the rising demand for air travel. This anticipated increase in the number of planes is likely to directly drive sales of aviation actuators to be employed in aircraft. 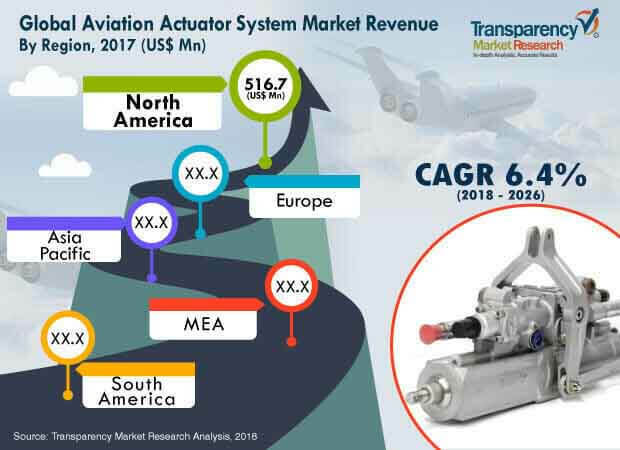 Thus, surging demand for air travel in developing economies is anticipated to fuel the global aviation actuator system market during the forecast period. Furthermore, adoption of electric actuators is becoming a major trend in the global aviation actuator system market. This is primarily attributable to limitations of mechanical and hydraulic actuators in terms of their performance and maintenance requirements and heavy weight. Moreover, electric actuators offer some significant advantages over traditional actuators such as reduced weight, less energy consumption, low power electronics, high reliability, high acceleration and stall torque capability, and effectiveness in handling of impulse load. Due to these factors, the electric actuator segment is expected to witness strong growth during the forecast period. However, intense competition among manufacturers is anticipated to hamper the global aviation actuator system market during the forecast period. The aviation industry is a fairly fragmented industry with various players providing products with high reliability, high quality, and efficient cost and aftersales service. This leads to stiff competition among aviation and aerospace companies providing aircraft and associated equipment. This factor may pose a restraint to the aviation actuator system market in the next few years. With the objective of expanding their business, several players are expanding their offerings through strategic mergers and acquisitions as well as partnerships. Some of the prominent players operating in the global aviation actuator system market are Aero Space Controls Corporation, GE Aviation, Honeywell International Inc., ITT INC, Microsemi, MOOG INC., PARKER HENNIFIN CORP, Collins Aerospace, Safran, Sitec Aerospace GmbH, Crissair, Inc., and Woodward Inc. This comprehensive report by Transparency Market Research analyzes and forecasts the aviation actuator system market at the global and regional levels. The report provides analysis of the market for the period from 2016 to 2026, wherein 2018–2026 is the forecast period and 2017 is the base year. An in-depth and unbiased market assessment has been made to provide readers with in-depth and accurate analysis. The report emphasizes all major anticipated trends in the aviation actuator system market from 2018 to 2026. It also focuses on market drivers, restraining factors, and opportunities in the global aviation actuator system market. The study provides a complete perspective about growth of the aviation actuator system market, in terms of value (in US$ Mn), across various geographies including North America, Europe, Asia Pacific, Middle East & Africa (MEA), and South America. The report includes detailed value chain analysis, which provides an extensive view of the global aviation actuator system market. The Porter’s Five Forces analysis provided in the report helps understand the competition scenario in the market. The study incorporates market attractiveness analysis, wherein actuator type, application, and end-use segments have been benchmarked based on their market size, growth rate, and attractiveness. In order to offer complete analysis of the competition scenario in the aviation actuator system market, attractiveness analysis of the market in every region has been provided in the report. The study provides a decisive view on the global aviation actuator system market, by segmenting the market in terms of actuator type, application, and end-use. The report provides a detailed, region-wise segmentation of the aviation actuator system market and sub-categorizes it into various countries, thereby providing valuable insights at micro and macro levels. The report further highlights the competition scenario in the aviation actuator system market, thereby ranking all major players according to key recent developments and their geographic presence. Insights for the aviation actuator system market are a result of extensive primary interviews, secondary research, and in-house expert panel reviews. Market estimates have been analyzed by considering the impact of different economic, political, social, legal, and technological factors. The aviation actuator system market in North America has been segmented into Canada, the U.S., and Rest of North America. Furthermore, the Europe market has been divided into France, Germany, the U.K., Russia, and Rest of Europe. The aviation actuator system market in Asia Pacific has been classified into China, Japan, India, and Rest of Asia Pacific. Middle East & Africa comprises GCC, South Africa, and Rest of Middle East & Africa. Similarly, South America includes Brazil and Rest of South America. The report provides all strategic information required to understand the aviation actuator system market. The report also offers insights into different components and applications according to various geographic regions mentioned above. The research methodology is a perfect combination of primary research, secondary research, and expert panel reviews. Secondary research sources include annual reports, company websites, SEC filings and investor presentations, national government documents, internal and external proprietary databases, statistical databases, relevant patent and regulatory databases, market reports, government publications, statistical databases, etc. Primary research involves telephonic interviews, e-mail interactions, and face-to-face interviews for detailed and unbiased reviews of the aviation actuator system market across geographies. Primary interviews are usually conducted on an ongoing basis with market experts and participants in order to obtain latest market insights and validate the existing data and analysis. Primary interviews offer new and fresh information on important factors such as market trends, market size, competition landscape, and growth trends. These factors help validate and strengthen secondary research findings. Moreover, the data collected from secondary and primary research is discussed and examined by TMR’s expert panel. The research study includes profiles of leading companies operating in the global aviation actuator system market. Market players have been profiled in terms of attributes such as company overview, financial overview, business strategies, and recent developments. Key players profiled in the report are Aero Space Controls Corporation, GE Aviation, Honeywell International Inc., ITT INC, Microsemi, MOOG INC., PARKER HENNIFIN CORP, Collins Aerospace, Safran, Sitec Aerospace GmbH, Crissair, Inc., and Woodward Inc. Companies are focusing on expanding their business through strategic acquisitions and partnerships.